This is FRESH AIR. I'm Terry Gross. My guest, Madeleine Albright, has written a new book, titled, "Fascism: A Warning." She writes, quote, "some may view this book and its title as alarmist. Good. We should be awake to the assault on democratic values that has gathered strength in many countries abroad and is dividing America at home," unquote. Albright was the first woman secretary of state. She was appointed to that position by President Bill Clinton in 1997, after having served as his U.N. ambassador. Her new book examines how fascism took hold in Hitler's Germany and Mussolini's Italy. Then Albright moves on to look at current authoritarian leaders in several Eastern European countries, Turkey, Russia and North Korea. One chapter is devoted to President Trump, whose election, she says, added to her sense of urgency in writing this book. Albright is now a Distinguished Professor of Diplomacy at Georgetown University. Our interview was recorded yesterday. Madeleine Albright, welcome to FRESH AIR. This book is a very personal one in a lot of ways because you fled fascism twice. Your family is from Czechoslovakia, where you were born. Your father was a diplomat. The family fled fascism when you were a child, first from Hitler. You moved to England, and then after World War II, you returned to Czechoslovakia but fled again, when the Communists were taking over, and came to America. What is the warning you want to send to Americans about what is happening here? 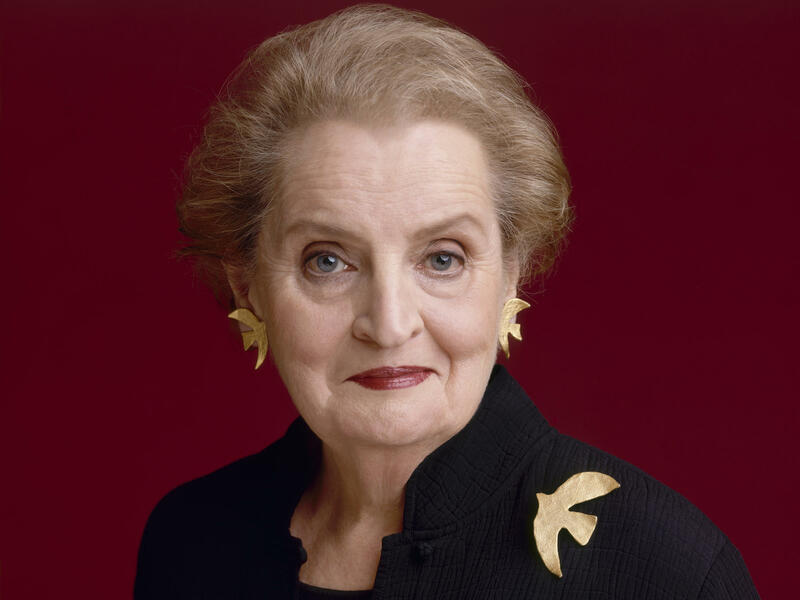 MADELEINE ALBRIGHT: Well, first of all, I'm delighted to be with you. But let me say the reason that I wrote the book and the warning is, as you've pointed out, it's something that I saw or have certainly heard about from my parents. And part of the reason for writing it is to say that in fact this can happen in countries that have democratic systems, that have a population that's interested in what is going on, that is supportive. Because so many of the things that have happened and happened in Czechoslovakia were steps that came as a result of ethnic issues with the German minority, but mostly steps that seemed not so terrible that there couldn't be a deal made. And so that's what's so worrisome, is that these fascism can come in a way that it is one step at a time, and in many ways then goes unnoticed until it's too late. GROSS: One step at a time within the system? ALBRIGHT: Within the system, and partially because it is a way of undermining democracy and the democratic institutions that are the basis of democracy, or criticizing the press or thinking that there are those that are enemies of the people and are the cause of distress or a bad economic situation. And it kind of works on the fear factor rather than the hope factor. GROSS: And with your father, for instance, he was a diplomat. He was close to the president of Czechoslovakia. And so when your father sensed that the Communists were taking over, the president of Czechoslovakia was saying, no, it's going to be fine. Don't worry about it. And your father left in spite of those reassurances. You know, the whole family left in spite of those reassurances, and you were lucky that you did. You write your father would have been put in prison had the family stayed in Czechoslovakia. So another example of how when fascism or authoritarianism or communism is coming, not everybody sees it. ALBRIGHT: And that's absolutely true because part of it, both with the fascism and with the communism, there really was not enough pushback from the people and to some extent the authorities there at the time. Or there's an outside power that doesn't support. So for instance, what happened when the fascists took over was the period that is known as appeasement that in fact was carried out by friends and allies, like the British, who gave in to what this group that was organized to help Hitler in what is known as Sudetenland, the small part of Czechoslovakia that was occupied by a German minority. And people thought, well, if we give in on this, nothing else will happen. And that is exactly what did happen. One step led to another. And if you are trying to feed the beast and the beast is a fascist, then it makes it very hard to push back. GROSS: Your book starts with a quote from Primo Levi, every age has its own fascism. What are you trying to say by using that quote? Are you saying don't expect fascism to look exactly like it did with Hitler or Mussolini or Stalin? ALBRIGHT: Well, that's exactly because one of the reasons that I wrote the book was to show the different ways that fascism has penetrated a lot of our societies now. And each one is a little bit different. And certainly eras are different. And so one has to look at what some of the signs are but not expected total replication, that everything is exactly the same - because both the situations in the country, the international situation, what is happening with technology, how people see their lives. So it's very hard. And frankly, Terry, the hardest part in the book was really coming up with exact definitions because it's always slightly different. GROSS: Would you just do, like, a roll call of democratic countries that you see turning authoritarian today? ALBRIGHT: Yes. And that's what's so unfortunate about it because what we really do have are - in Europe, for instance, the prime example is Hungary with Viktor Orban, who is now talking about illiberal democracy, which is basically a way to deal with whoever is not, in his description, a Hungarian so he can go after immigrants. There are - then in Turkey we're seeing a problem where in fact Erdogan, who was elected popularly, has accumulated a lot of power and wants to change the rules and the laws and the constitution in order to be able to be there longer. We have the fact that Poland is kind of mimicking what Hungary did. And then what we have in Europe also - and these are friends and allies - are other countries where there is an element of those that are taking advantage of the fear factor in some way, as I said. For instance, in Germany, all of a sudden there's a very far-right party that is now in the parliament. We just saw the elections in Italy, which are also parties that are on extremes are taking advantage of a particular situation. Then we have the issue in the Philippines, where Duterte thinks it's terrific to kill drug dealers and talks about all the things that he has accomplished in that particular way. And then of course we've got what's going on in Russia with Putin. And then I have to say what I find - and this all has kind of happened since the book was written - is what in fact has happened in China with the changing of their constitution in order to make Xi Jinping be able to be a lifelong leader of a party. So there are a number of different places, but I think that the ones that really looking at what is happening in Europe and then of course in our own hemisphere, with Venezuela. That is another example of a country where initially Hugo Chavez came in as a result of the fact that the tired old men that were running the place before had not really had a relationship with the people. And then Chavez changes, and he becomes an authoritarian and, I would say, a fascist. GROSS: So you can't blame all of these countries turning to fascism or authoritarianism. You can't blame it all on immigration. You can say immigrants are the scapegoats in some Eastern European countries and in Europe but, you know, not in China, not in Venezuela. So when you look at the sweep of nations that you've just mentioned, is there any kind of overarching explanation you could give why so many parts of the world are moving toward or have already moved to authoritarianism? ALBRIGHT: Well, I think that a lot of it has to do with the era that we're in where there has been very rapid change in technology, and that has created a lot of joblessness in countries. There is a whole way that technology and information is passed without making sure that it's really true. There are those people who are angry because the status quo hasn't changed while the climate within a country has changed and that the powers that be in a democracy are not responding quickly enough. And so it's kind of like we're really seeing - it's a little bit as though we were seeing that the people are getting their information on 21st-century technology but the governments are providing 19th-century responses. And so the institutions are not responding to the divisions and the problems that people are having in these countries. And then the other part of this, which I think is essential, is there is some leader at the top who takes advantage of these divisions and, in fact, exacerbates them so that the societies are more and more divided and wrangled and looking for scapegoats, which is where the immigrants come in. But mostly, this is something that's created internally by massive changes in society and some of them due to technology. GROSS: Let's talk about what's happening in the United States. I want to read a passage that you write in your book, "Fascism: A Warning," a passage about President Trump. You write (reading) we've never had a president, at least in the modern era, whose statements and actions are so at odds with democratic ideals. Trump has spoken harshly about the institutions and principles that make up the foundation of open government. In the process, he has systematically degraded political discourse in the U.S., shown an astonishing disregard for facts, libeled his predecessor, threatened to lock up political rivals, bullied members of his own administration, refer to mainstream journalists as enemies of the American people, spread falsehoods about the integrity of the U.S. electoral process, touted mindlessly nationalistic economic and trade policies and nurtured a paranoid bigotry toward the followers of one of the world's foremost religions. Do you think that President Trump has the instincts of an authoritarian leader? ALBRIGHT: I think that he is the most anti-democratic president that we have had in modern history and that his instincts are really in that direction. And I think that that's what worries him. And the passage that you read really does show that what he's trying to do is undermine the press and has disdain for the judiciary and the electoral process and minorities. And I think that his instincts are not ones that are democratic. And he is interested basically in, I think, exacerbating those divisions that I talked about. And so I am very concerned. And basically, this is - you know, I'd written the book because I have picked up that phrase, see something, say something. And I am seeing some things that are the kinds of things that we've seen in other countries. And so I'm saying not only should we say something, but we have to do something about it. GROSS: Well, why don't we take a short break here? And then, we'll talk some more. If you're just joining us, my guest is Madeleine Albright, who was secretary of state under President Clinton. Her new book is called "Fascism: A Warning." We'll talk more after a break. This is FRESH AIR. GROSS: This is FRESH AIR. Let's get back to my interview with Madeleine Albright. She served as secretary of state under President Bill Clinton. She was the first woman to hold that position. Before that, she was Clinton's U.N. ambassador. Her new book is called "Fascism: A Warning." The president has stated many things that aren't true, verbally and also through Twitter. Just over the weekend, he tweeted about DACA - these big flows of people are all trying - he's talking about people crossing the border from Mexico. These big flows of people are all trying to take advantage of DACA. They want in on the act. Well, you have to have been here by 2007 to take advantage of DACA, so anybody crossing the border now cannot take advantage of DACA. What are your concerns when the president tweets or says something that is just not true but a lot of people who hear or read him won't know that? They won't know it's not true. ALBRIGHT: I have to say, on the whole issue of DACA, he has so many things wrong that I wonder whether he is deliberately lying or whether he really doesn't understand the issue. And he just says whatever is on the top of his head because I heard that statement and I thought, seriously? I mean, you know, or you should know, what DACA is about - and then also blaming the Democrats for the problem when that definitely is not the answer. So I do think this is the issue that we have to be so careful about. I think people may disagree with the president of the opposing party or for some reason may disagree, but we normally have believed that the president tells the truth. And I think I'm very - I know that I'm very worried about the fact that there are deliberate ways of misstating the issue and then that the people think, well, if the president said it, it must be right when it's just a deliberate untruth. GROSS: You write about how shocking it is to you to cross the Atlantic and hear America described as a threat to democratic institutions and values. What are you hearing? ALBRIGHT: Well, I think that - there are several things that I'm hearing. One is that people have no idea what Trump is actually trying to do to really terrific confusion about that in terms of how democracies have supported each other in the past and that the United States has really been, as we have all spoken about it, is the beacon of freedom and hope. And all of a sudden, we are not viewed as that. And, in fact, the opposite, which is that Trump supports and praises people like Orban or Kuczynski in Poland and then he goes, for instance, to Poland and stands next to the leader and is very happy that they have in fact lowered the role of their judiciary or are speaking against the press. So the United States is behaving in exactly the opposite way from what had been expected before. And so that is the issue. America has been viewed as really a country that stood behind democratic principles, human rights, was not for torture, was not for really undermining aspects of democratic society and that we're not fulfilling the role that we're supposed to. And America, the leader - the chair of the leader of the free world is empty. GROSS: President Trump, when he was campaigning, when he talked about NATO, he'd talk about how America was, like, spending too much and European countries are spending too little when it came to dues. And he seemed to see NATO as being about, like, some kind of business arrangement where America was being played. We were being taken advantage of because we were paying more. You were secretary of state when NATO opened its doors to Eastern European countries. And Poland, the Czech Republic, Hungary, they entered NATO in 1999 when you were secretary of state. So NATO was very important during your tenure in that position. I mean, the shape of NATO changed. And now we've seen Brexit, and we've seen President Trump having this kind of changeable, ambivalent position about NATO. How does that feel personally? Because you were so - like, NATO was such an important part of your professional life as secretary of state. ALBRIGHT: Well, I see it as the most unbelievable step backwards because I do believe that the United States is stronger when we have friends and allies to deal with the various issues, whether they are in area, as we say, members of NATO itself or out of area, whether it's in the Balkans or Afghanistan, that the Europeans and NATO are really part of this incredible alliance that we've had. And I always say, as a European who has spent her life in the United States, I see the Euro-Atlantic Alliance as one of the most important bulwarks of our society. So seeing this go on, I find appalling. And what is the issue, again, it's this lack of understanding of what this alliance is about. It is not somebody coming to rent hotel rooms to see if they can get the best price or - it is not transactional. It is something that is basic to our system. And so I think one of the parts, though, Terry, is that he's gone back on certain things. So that - he generally has now said that he's supportive of NATO. So one of the parts that's a little bit confusing - what is he really for, what is he against? Is it one of those things where the last person that speaks to him has all the influence? But I do think that what is going on with Europe and our relationships with Europe are part of the very - you know, are really a big part of the problem in terms of a lack of understanding about America's role. And then one other part I think that is really part of this story is that what Trump is doing is making America seem like a victim. Everything is somebody else's fault. Countries are taking advantage of us. The Mexicans are sending drug dealers. Countries are not paying their dues. The trading system is unfair. And by making Americans seem like victims all the time, it then is able to, again, make the divisions stronger in terms of who's with us, who's not with us, and it's totally anti-American foreign policy. And so I think it's very, very worrisome in terms of this victimhood. I don't see America as a victim. I see America as the most powerful country in the world that has a role to play standing up for democratic ideals and human rights across the board. GROSS: My guest is Madeleine Albright. Her new book is called "Fascism: A Warning." After we take a break, we'll talk about President Trump's planned meeting with Kim Jong Un and Albright's meeting with Kim Jong Un's father when she was secretary of state. And John Powers will talk about re-watching "2001: A Space Odyssey." This week marks the 50th anniversary of its premiere. I'm Terry Gross, and this is FRESH AIR. GROSS: This is FRESH AIR. I'm Terry Gross, back with Madeleine Albright. She's written a new book called "Fascism: A Warning" that examines how international momentum toward democracy has slowed and, as she says, so many charlatans are seeking to undermine public confidence in elections, the courts and the media. One chapter is devoted to President Trump. Albright served as U.N. ambassador under President Bill Clinton and was his secretary of state from 1997 until January 2001. She's now a professor at Georgetown University. It's expected that President Trump will meet with Kim Jong Un of North Korea in May. You were the first and only secretary of state to meet with the leader of North Korea. It was Kim Jong Il on what - at the time you were secretary of state. So he was the son of the, quote, "great leader" and he's the father of today's leader, Kim Jong Un. Tell us how you prepared for that meeting and how long you prepared because a lot of people have the impression that President Trump is kind of, like, going to show up and wing it. I mean, I don't know. I don't know if that's true, but I think that's a fear that a lot of people have. ALBRIGHT: Well, and it's a legitimate fear. And let me just say the Clinton administration, we had had a number of iterations dealing with the North Koreans in terms of trying to get them to give up their nuclear potential and trying to deal with them on what they had issues with - their missiles and their missile limits, any number of different things. Many, many months - years, actually, of work together. But what happened was that because we have no representation in North Korea, we really relied on our intelligence systems and on our friends. And we worked incredibly hard to get ready for it. The preparation for it took a very long time. And I'm very worried about this kind of haphazard approach to this where on one day, President Trump is talking about a rocket man and doing his kind of normal gross language about things. And then all of a sudden, he's prepared to meet. And these meetings, you really have to be prepared for the meetings themselves. We have no ambassador in South Korea. The main person that was doing the Korean - the main person that was really working on Korea in the State Department has resigned. And so it's a combination of lack of preparation, lack of personnel and a president who is kind of going in a different direction every other day. So I think it is a dangerous situation. It's a dangerous situation if we don't have diplomatic talks. But it's also dangerous in terms of the back and forth. GROSS: So you were the first and only secretary of state to meet with the head of North Korea, and you were able to negotiate an agreement with Kim Jong Il. ALBRIGHT: Well, we were in the middle of doing it, frankly. What happened was that what we were dealing with was questions about missile limits, a very technical subject which Kim Jong Il knew a great deal about. And I was able to have a discussion with him. And we were just beginning talks in Kuala Lumpur when the election of 2000 happened. And the Bush administration - well, I'd had briefed Secretary Designate Powell on what was happening. He thought it was very interesting. And then a headline appeared saying Powell to continue Clinton policies in North Korea. The White House disagreed, and they were cut off. So we were getting somewhere, and by the time when we left office, the North Koreans didn't have fissile material. They didn't have these kinds of missiles, and they didn't have nuclear weapons. So it was a big loss that we weren't able to go forward. GROSS: So the State Department - and, you used to be secretary of state - the State Department has in some ways been dismantled. There's a lot of open ambassadorships. There's a lot of unfilled positions within the State Department. Why does that matter? ALBRIGHT: Well, it matters because diplomacy, as I said, is the way that we deal with issues with other countries where we might have some disagreements. By the way, I teach at Georgetown, and I say foreign policy is just trying to get some country to do what you want. That's all it is. So what are the tools? And my course is called the National Security Toolbox, and the basic tool is diplomacy. It's either carried on bilaterally between two countries or multilaterally at NATO and the U.N. And you require diplomats to do that. And that is the State Department's job, people who are trained to know what the history of a country is, what the issues are. They speak the language. They develop relationships with people in that country. It is a professional job by people who deeply care about the national interests of the United States. It was Thomas Jefferson's job. It is the oldest department in the government, and I think that what has happened to it is a tragedy. And to some extent, I believe it's criminal because what has happened is the Trump administration has deliberately cut the funding for the State Department, and if it hadn't been for Congress, it would be in even worse shape. And it has really made it difficult for professional diplomats to be there because they have been suspected of not, quote, "being loyal." So I'm absolutely appalled. I think it is a tragedy, and I hope very much that, thanks to the work of Congress, that this decapitation of the oldest department will stop. GROSS: Mike Pompeo is President Trump's choice to be secretary of state to succeed Rex Tillerson. Pompeo has been the CIA director in the Trump administration. And I'm wondering if you think having a CIA director in a diplomatic position will - if it has the possibility of raising suspicion in foreign countries where all Americans there are seen as somehow being spies for the CIA? (Laughter) Do you know what I mean? That's a kind of running theme. ALBRIGHT: I don't think that's fair, but what I would like to - I'm looking forward to the hearings so that we know what his responses are on some of the previous policies of the CIA of the United States. And that's why I think the hearings are going to be so important in terms of what direction Director Pompeo's going to take. So I'm looking forward to those. GROSS: So you're not concerned that he's been CIA director? ALBRIGHT: That's not my major concern. I think my major concern is, what are his policies and how does he see the direction, the strategy? How does he fit in with the process? And then I have to say, how is he going to work with John Bolton, who is not about to be confirmed therefore there won't be any hearings? And everything that he's ever said I find completely objectionable and something that is very, very dangerous. GROSS: What are your concerns about John Bolton? ALBRIGHT: My concerns are that he has been an outspoken person for the use of force, for the absence of diplomacy, for tearing up the Iran nuclear deal, for thinking that force is possible with North Korea. And frankly, part of the problem is from what we've been saying about President Trump and what one reads all the time, is that he listens to the last person who has talked to him. And the national security adviser is most often the last person. So I am concerned about that. GROSS: My understanding is that the defense budget has grown while the president wanted to seriously shrink the State Department budget. What is the relationship between the State Department and the Defense Department when it comes to countries like Iran or Russia or North Korea? ALBRIGHT: Well, I think that one of the most interesting parts of our government - and has been for a long time - is the relationship between the Defense Department and the State Department. And historically, it has been very interesting. What I find particularly interesting now is that Secretary Mattis has said that he would prefer to have more money for the State Department, otherwise he has to buy more ammunition - and a real understanding that the State Department is needed in terms of cooperation on all those issues. And the other part that I think is so important - and I have sat in on meetings that are known as the principals meetings that are held in the Situation Room of the White House where the national security adviser tries to develop a policy to give to the president. And the major part of that that makes it valuable is for the departments to state their views clearly, to have a certain amount of discourse and maybe even dissent because that's what's democratic, is to understand, what are the various paths to follow? How do you get from point A to point B? What does the State Department do? What does the Commerce Department do? And that's the part that's really important - to what extent does the president appreciate when there are dissenting views when they are presented in a way - President Clinton used to love to have us come and argue in front of him so that we really had to understand what we were all for. And I can't tell to what extent that goes on now. GROSS: Let's take a short break here, and then we'll talk some more. If you're just joining us, my guest is Madeleine Albright, who was secretary of state under President Clinton. Her new book is called "Fascism: A Warning." We'll talk more after a break. This is FRESH AIR. GROSS: This is FRESH AIR. And if you're just joining us, my guest is Madeleine Albright. She served as secretary of state under President Bill Clinton. She was the first woman to hold that position. Before that, she was Clinton's U.N. ambassador. Her new book is called "Fascism: A Warning." Let's talk about Russia. We have evidence now that Russia interfered in the presidential election. We don't know what their plans are for the midterms. If you were secretary of state, would you see a role for yourself now in dealing with future Russian interference in our democracy? ALBRIGHT: Well, from everything that I have read, I think that it is a dereliction of duty not to see what the Russians have been doing and that this really requires a whole-of-government approach to it where the President directs the various parts of the government to do what they have to do to figure out what the Russians are up to and how to prevent them from doing more during the midterm election and all the time, frankly. And then, also, and as secretary of state, the other part that would be important is to point out what the Russians are doing in other countries. We know, for instance, what has been happening in Europe. And we talked about Hungary. There's no question that the role that Putin has played in giving kind of advice and being a role model for Orban - that's important. Then they have, in fact, undertaken a lot of propaganda and false information throughout Europe. There are even those who think that they were involved in the Brexit vote and, clearly, the kinds of things that they're now doing in terms of using chemical ways of getting rid of people they don't like. So as the secretary of state, what you try to do is to look at, what are the effects of Russia's behavior among our friends and allies? Who needs help? How do we share intelligence? And what do we do to make sure that our democracies are not undermined? And that's the role of the secretary of state. GROSS: You met with Vladimir Putin when you were secretary of state. What was his position at the time? ALBRIGHT: Well, it was interesting. The first time I met him was when he was still kind of acting president at an APEC meeting that took place in New Zealand. And he was in a stage of his life where he seemed to want to be very ingratiating to everybody and wanted to kind of pretend - or was, in fact, kind of a small figure. Then, when I went back to prepare for the summit that President Clinton had in the summer of 2000 - and I have to say, I was very impressed with how smart Putin was. And when he met with President Clinton, he - Putin - was able to talk without notes, as President Clinton was, and also took notes and really was very smart. I think that he is a smart man. He has played a weak hand very well. And he is a former KGB officer, and we can never forget that. GROSS: You wrote down your impressions of him after your first meeting, and you wrote, Putin is small and pale, so cold as to be almost reptilian. Putin is embarrassed by what happened to his country and determined to restore its greatness. That kind of holds up. ALBRIGHT: Well, it does. And part of it, I have to say, is that in '91, when I - before I went into the government, I did this survey of all of Europe after the end of the Cold War. And we did a lot of questionnaires, but also focus groups. And I will never forget a focus group outside of Moscow where this man stands up and says, I'm so embarrassed; we used to be a superpower, and now we're Bangladesh with missiles. And so what Putin has done is identify with that kind of loss of national pride that the Russians have had, and he has restored it from - in their eyes. And so he is popular, and it has something in terms of restoring Russia's position. And as I say, he has played a weak hand very well. GROSS: So an interesting anecdote in your book - and this takes place in 2003, when you were speaking in Turkey. And, you know, as we've been saying, like, identity is such a big issue in this era of, like, nationalism and anti-immigration feelings. So you're in Turkey. You're giving a speech. And then during the Q&A, you're asked your opinion of whether women should wear headscarves. And there's women with headscarves in the audience and women without them. And you say, well, that's easy; it should be a woman's personal choice. And you say that everybody in the room hated you after that. (Laughter) That was, like, an incredibly unpopular response. What's the moral of that story? ALBRIGHT: Well, I think the moral is that we cannot think that everybody wants to be like American women. I have - again, to go back on this survey that I did in the '90s, a lot of women that had lived under communism had basically been liberated to work twice as hard. So one of the questions that we asked in that was, do you want to have a marriage where you stay at home and take care of the children, or do you want to have a job? And I can't remember the exact numbers, but most of the women wanted to be at home with their children. And so I think we do have to be careful not to think that everybody wants to be like us. And so I believe that we need to be helpful where we can, where women in countries want to have support from outsiders, and be supportive of women running for office, and try to figure out how to end domestic violence and a variety of different things. But the issue there - and it really did surprise me, I have to say - was that I gave a typically American answer. I mean, I always think that for women, the best word for us is choice. We need to be able to choose what we do with our bodies, and our lives and how we generally operate. And I was surprised that I had given a typical American answer that didn't suit anybody. And it continues to trouble me because I think we have to be careful not to mirror image. On the other hand, we need to be helpful. GROSS: Well, Madeleine Albright, it's been a pleasure to talk with you. Thank you so much. GROSS: Madeleine Albright's new book is called "Fascism: A Warning." Our interview was recorded yesterday. Coming up, our critic-at-large John Powers rewatches "2001: A Space Odyssey" on the occasion of its 50th anniversary. This is FRESH AIR.